The choice is up to you! Our Grass Fed New Zealand Spring Lamb is available bone-in or boneless. A boneless leg is easier to carve, while bone-in can be a bit more difficult to slice. If you’re looking for a more intense lamb flavor, bone-in is the way to go. How Long Should You Take Lamb Out Of The Fridge Before Cooking? Immediately putting this large cut of meat in the oven after removing it from the fridge can lead to uneven cooking and an even longer cooking time. To ensure a leg of lamb cooks evenly, remove it from the fridge and let it sit at room temperature for an hour before cooking. Rare, Well-Done, Or Something In Between? How well-done you like your lamb comes down to personal preference. This tender and juicy cut of meat can be served from rare to well-done. 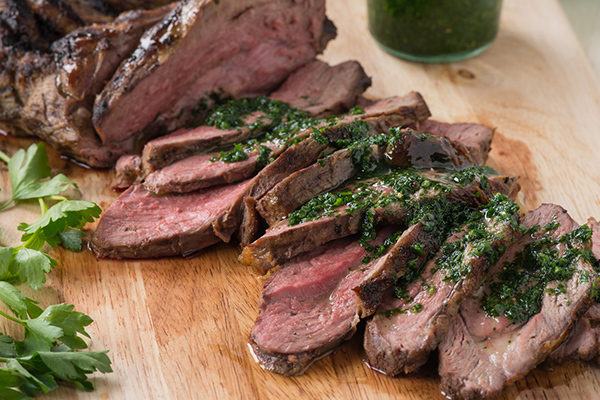 After roasting or grilling a leg of lamb, allow the meat to rest for at least 15 minutes before serving. This helps the juices redistribute throughout the meat instead of over the cutting board! When it’s time to carve the cooked leg of lamb, slice it across the grain (perpendicular to the bone). This will help you get the most tender slices. Are you ready to get cooking? Let your culinary creativity roam with New Zealand Spring Lamb. Stuffing isn’t just for turkeys! This boneless leg of lamb with sage, fig, and prosciutto stuffing is a delicious centerpiece for your dinner table. The classic flavors of tomato, garlic, and olive oil pair perfectly with a roast leg of New Zealand Spring Lamb. Hosting a get-together at your place? A roast leg of lamb with stuffed onions is sure to delight your guests! Bring the flavors of the Mediterranean to your table.